When your business is experiencing rapid growth, sometimes your needs don’t scale uniformly. You may find that you need specialized marketing and strategy services that can help you continue to move forward, but that you aren’t ready for big six-figure commitments. While traditionally, businesses have either had to chose between options that were less than ideal, our model offers choices that are a perfect, customized fit. We’d like to introduce you to the Fractional CMO and what someone in this role can do for your brand. In one scenario, they hand CMO tasks to a more junior person from within their organization. This is someone with a marketing experience and background. However, they lack the executive background that is the other part of the CMO’s job. This person starts out handling tasks like posting to social media, writing blog posts and others. But, over time, they get overwhelmed. If they are tasked with creating strategy for the business, they may be over their heads. Not everyone can handle content strategy effectively. Sometimes you find a diamond in the rough who just needed an opportunity, but, those people are rare. Maybe one in 100 effective marketers has the skill to move on to these important executive positions. The other path is to take the leap and hire a CMO, either from a competitor or from someone in a similar industry. This can wind up putting a significant drain on a growing company’s funds. When a company is bringing in revenue of around $750,000 per year, tying up a third of that in one salary can be crippling. It can be very hard to make that investment worthwhile. A Fractional Chief Marketing Officer is someone who performs the function of a CMO without forcing your company to commit to a full-time person in that role. Think of it as CMO as a service. Many organizations already recognize the value of outsourcing other C-Suite functions, such as the CFO. They may not need the services of a Chief Financial Officer full-time. Instead, they need someone to come in and perform this function for a few hours a week. They bring in someone who has the top level experience that they need, but who doesn’t tether them to the cost of having someone like that as permanent staff. By working with a fractional CFO, the business can get the benefit of a CFO’s guidance and skills without having to have one on staff full-time. You recognize that you need to delegate. We feel that a company does best when each person in the organization is engaged in the tasks that they are best at. As the CEO, you have a specific skill set and value that you bring to your business. It is likely that you do not have up-to-date knowledge about marketing tasks. It is also likely that you don’t have the time to learn or to engage with these tasks on a regular basis. You know that your enterprise is not ready for a full-time CMO. A CMO with the experience and skill you need will likely cost $250,000 per year. This is before benefits like health insurance and retirement accounts are worked in. At the level where you are now, there might not be enough for a full-time CMO to do. If you hired one, their average week would probably involve 10 hours of essential tasks, then another 10 to 20 of tasks that are a level down in urgency. They’ll check in with people and write emails. The final 10 each week would be filled with busy work. You are committed to a lean organization. Why spend a quarter to a third of your revenue on something that provides only diminishing returns? Intrigued? We’d love to talk more. Please accept our invitation for a 30 minute Clarity Call with our CEO, Casey Stanton. We’ll waive the cost. 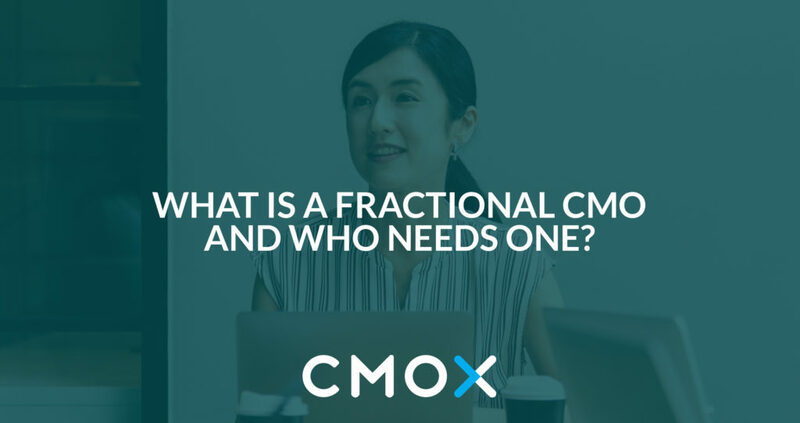 This entry was posted in Fractional CMO and tagged cmo as a service, cmox, fractional cmo, outsourced cmo, part-time cmo.